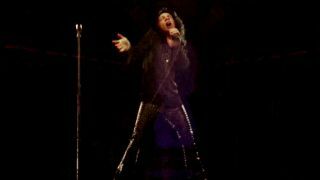 Dio drummer Simon Wright has described the experience of performing with a hologram of the late singer as “nerve-racking” – even though he couldn’t see it from his position on stage. The projection was debuted during the Dio Disciples’ set at Wacken in Germany last month, and widow Wendy Dio later said it had reduced her to tears. A full tour is planned for next year. Ronnie James Dio died of cancer in 2010. Wright tells Mitch Lafon: “In a way it helped that I couldn’t see it and I could just see the light. “It was pretty nerve-racking. I wanted to get it right and we wanted it to be good. I’m sure as we do more shows it’ll get easier. Wright was a member of AC/DC from 1983 until joining Dio in 1989, and when asked about the Australian giants’ future, now that leader Malcolm Young, singer Brian Johnson and bassist Cliff Williams have all bowed out in the past two years, Wright says: “Lots has happened in a short period of time, first of all with Malcolm – that really threw me. Dio Disciples are preparing to record their debut album.